As the trenchless subconsultant to Hydroscience, Bennett Trenchless Engineers assisted with the design and inspection of 257 feet of 54-inch casing for a 36-inch ductile iron water carrier pipe. Trenchless construction methods were required to cross beneath Interstate 80. Bennett Trenchless was contracted to design the crossing and to assist with the Caltrans permit application. Microtunneling was selected to install the pipeline to effectively excavate the fractured rock and ensure a stable excavation to minimize settlement risk to the Interstate. The stable soil conditions and lack of groundwater allowed the use of trench boxes for the shafts. 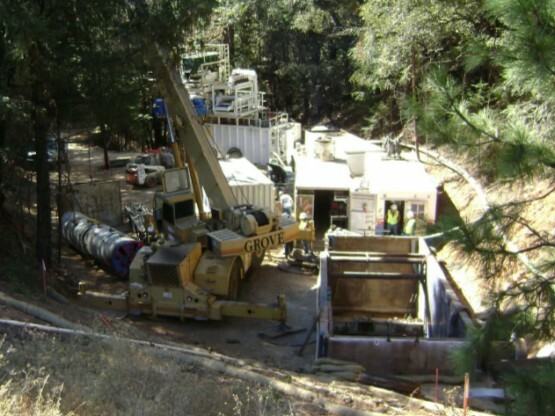 Challenges on the project included coordination with Caltrans, difficult ground conditions, a 50-foot elevation difference between the jacking and reception shafts, tight working areas, and access issues. The project site was very remote and access to both shaft locations was constrained and difficult. In addition, the reception shaft was located within a steep ravine and presented challenges for shaft construction and microtunnel machine retrieval.